Shaved heads have come in and out of fashion over the past few decades, but some people don’t have the option of allowing their locks to grow. Thankfully, for those who do suffer from hair loss, or alopecia, help may be at hand. Somewhat counter-intuitively an effective treatment for baldness may come from plucking a certain number of hairs – in a specific formation – from the scalp. We demonstrated that plucking a few properly arranged hairs can trigger regeneration of hair follicles stem cells in up to five times more neighboring, un-plucked surrounding hairs. Recently, we accidentally discovered that regeneration could occur through a collective decision-making process. By plucking the correct number of hairs with a proper arrangement, up to five times more neighboring, unplucked resting hairs were activated to regrow. But if the number of plucked hairs was below a threshold, no hairs regenerated. Quorum sensing can be thought of as a decision-making process which is dependent on certain criteria being met within a population. Signaling molecules are released by each stimulated component of the population, the more components that are stimulated the more signal molecules are released. As the elements in the system are able sense the number of signal molecules released by the population as a whole, they can also sense the degree of stimulation. When a certain threshold of stimulation is reached, a collective response from the components in the system will follow. The process of quorum sensing has been used to describe bacteria cell-to-cell communication, where the expression of certain genes is coordinated between many bacteria in response to environmental factors such as an increase in the presence of bacterial toxins. Quorum sensing has also been used successfully to explain the behavior of social insects such as ants and honey bees for their collective decision-making. 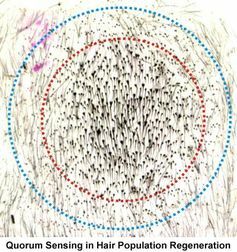 But in reality, how does the population of hair follicles “cast and count its vote” in quorum sensing?. First, there is a stimulus – such as hair plucking, which stimulates follicle stem cells – to some, but not all, hair follicles. Second, the plucked hair sends out a signal to surrounding cells. Third, the group of cells gauges the intensity of signal from its surroundings. In the most simple cases of quorum sensing, the signal molecule spreads by diffusion from the secreting cell. But it was found that the signals being released by plucked hair follicles were traveling further than could be achieved by simple diffusion, suggesting that a something more complicated was involved. This finding also is important in the field of regeneration medicine as a whole. We believe that the quorum-sensing behavior principle is likely to be present in the regeneration of tissue and organs beyond the skin. Using such efficient regenerative strategies opens a new window in treating hair loss as well as many other degenerative disorders. By Cheng-Ming Chuong, Professor of Tissue Development and Regeneration at University of Southern California. This article was originally published on The Conversation. Read the original article.